The Pilot’s Wife meets The Road in critically-acclaimed poet Laura Kasischke’s new novel of marriage, motherhood, and the choices we make when we have no choices left. It was like a fairy tale. Jiselle almost couldn’t believe it when Captain Mark Dorn, respected, handsome, tragic father, chose her to be his wife. The other flight attendants were jealous that she could quit her job (since the outbreak of the Phoenix Flu, passengers had become even more fractious and nervous, filling a flight attendant’s time with a million irritations), jealous that she would move into Mark Dorn’s perfect cabin in the woods, even jealous that she would be stepmother to Mark Dorn’s three beautiful children. But it is no fairy tale. As she settles into married life, Jiselle begins to realize that Mark is away most the time, flying international routes. And she’s pretty sure that his daughters hate her. And the Phoenix Flu, which Jiselle had thought of as a mere illness when she had thought of it at all, has begun to spread in new and alarming ways that will threaten Jiselle’s marriage, her stepchildren, and the very lives they’d all imagined…. Laura Kasischke is the author of Boy Heaven, her first novel for teens, as well as The Life Before Her Eyes, Be Mine, and seven collections of poetry. She has twice received fellowships from the National Endowment for the Arts, and her writing has been published in The New Republic, Harper’s, Poetry, and The American Poetry Review. She is an assistant professor at the University of Michigan, where she teaches creative writing in the MFA program and the Residential College. She lives in Chelsea, Michigan, with her husband and son. 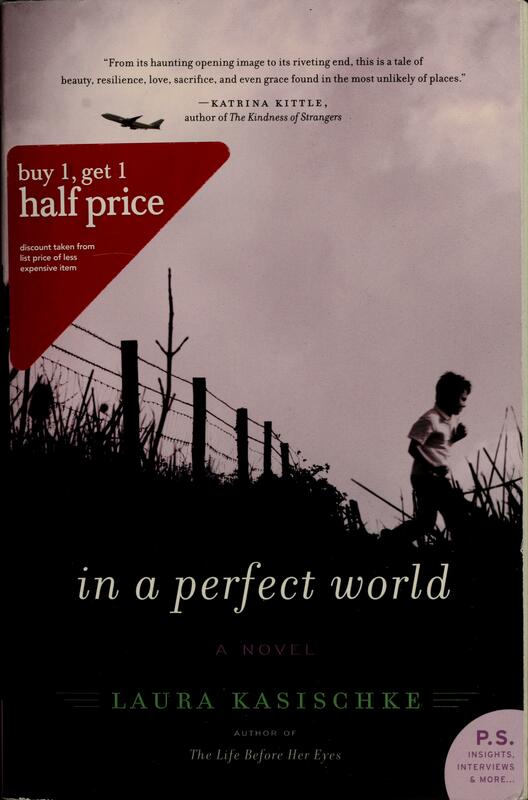 Numerous fairytales are interwoven with the plot of In a Perfect World. What are some of these tales, and how do they function within the story? How might this novel be read, itself, as a kind of fairytale? The unfolding of the love story between Jiselle and Mark is cut short with his quarantine and is soon overshadowed by her life with his children. How does this become its own romance, and in what ways does this shift comment on expectations regarding love and marriage? How do you feel about the changes in Jiselle’s character as the novel unfolds? How do you feel about the way she handles and reacts to the events of the novel, particularly the demands of step-motherhood? Joy is a character who is never encountered in the novel, but who seems important nonetheless. How do you interpret her shadow-character, and how does Jiselle’s ‘relationship’ to her change during the course of the novel? The author researched the Black Death in writing this book. Which events seem historically familiar? Which details seem to parallel contemporary concerns and events? Does the plot seem more fabulist than realistic? Can you imagine the kind of future the author has imagined? Did you see Mark as a sympathetic character? Was Jiselle foolish to marry him? At which moments in the novel do we see Jiselle’s relationship to the children changing? Do you feel that, at some points, they become ‘her’ children? If so, where in the novel does this seem to occur? Jiselle and the children are very isolated in this novel. Does this seem realistic to you? How do you feel about the few additional characters who figure in it: Jiselle’s mother, Paul Temple, Tara Temple, the Schmidts? What does the title, In a Perfect World, say to you about the themes and structure of the novel? Is this an apocalyptic novel? What is your interpretation of the ending?